"Hey, look! It's Rock 'Em, Sock 'Em, Robots!" That seems to be the first thought people have when they see the trailer for this movie as most kids have had some version of the classic robot boxing toy. 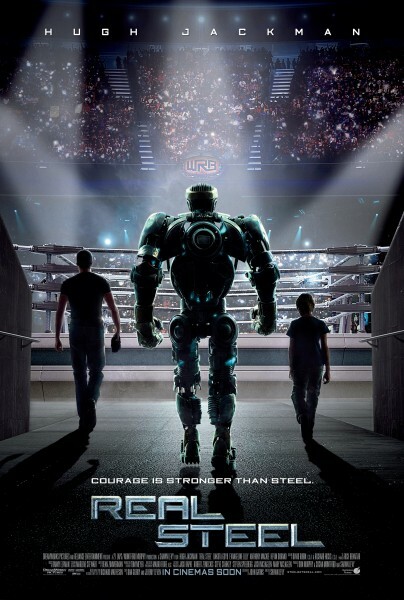 I know my brother and I had ours and this movie takes the concept of robots duking it out and gives it a high tech makeover that has the perfect one-two punch combination of stunning visuals and the classic inspirational sports story. This is rags to richest at its finest in the tradition of Rocky and The Karate Kid (the original) and there is no shortage of moments that will tug at the heart strings mixed in with lots of fiercely intense robot battles. At the core of this movie is the story of former boxer and down on his luck Charlie Fenton played enthusiastically by Hugh Jackman. It was nice to see him not being Wolverine for once and he does a great job of really getting in to the role and bringing a strong performance. Not Oscar caliber by any means, but you can relate to and sympathize with what Charlie is going through and you find yourself rooting for him even when he's making all the wrong decisions. Boxing and gambling are a way of life for Charlie until circumstances bring his estranged son, Max back in to his life. When it comes to movies that feature a child actor in a prominent role, the quality and believability of their performance can either make or break a movie. I had never heard of Dakota Goyo before this movie (although I did just learn that he played the younger version of the God of Thunder in Thor for a few brief scenes) and I was pleasantly surprised to see him hold his own in a picture of this magnitude. Playing Charlie's son Max, he gives the character a great sense of purpose and determination which is a nice counter balance to the way Hugh Jackman gives Charlie the lost, go for broke mentality that gets him in to trouble more often than not. During a trip to the scrap yard, Max rescues an old sparring robot and looks to rebuild him as a fighter. After a lot of persuasion by both Max and Charlie's long time friend and love interest Bailey Tallett (Evangeline Lilly), Charlie agrees to take Max in to the world of robot boxing. Thinking this will be a quick trip that ends in a pile of crushed robot parts, Charlie is very surprised to see their fighter, "Atom", hold his own against any competition that comes their way. This eventually leads to a shot at matches in the World Robot Boxing league and an inevitable showdown with Zeus who is the undefeated champion. If you like movies that have the ability to entertain, inspire, and make you say "wow, look at that! ", I'm sure you will enjoy this movie. There was a definite effort here to appeal to kids of all ages and having robots as the ones knocking each other around the ring is a great way to have some good action mixed in to the story without the PG-13/R rated violence that you might get from similar fare. Family friendly and ready for mass appeal, this should be a movie that does big business over the next couple months. If you're not careful this trailer may knock you out! Also, check out this great video interview with Sugar Ray Leonard who actually choreographed all of the robot fight scenes in the movie. The Avengers Official Trailer Debuts!